Woodlore has long been recognised as the UK's premier Bushcraft school, having run courses and overseas expeditions for over 30 years. Based on our combined first-hand knowledge and understanding of the outdoors, we believe we have the best and most experienced team in the business. Ray is one of the few true outdoor legends and for over 30 years he has been running courses in the UK and overseas, sharing his knowledge with those who have sought to learn more about our unique world. It is often said that before Woodlore, there was no Bushcraft in the UK. During Woodlore's extensive history, Ray has led courses in many diverse environments, including the Arctic, Jungle, Temperate Rainforest and Desert, and has spent time with some of the last remaining indigenous peoples in some of the remotest places on the planet. Tracking has long been a passion of Rays and with over 40 years dedicated to the study and interpretation of sign, Ray brings a unique wealth of knowledge of this specialist skill to the team. 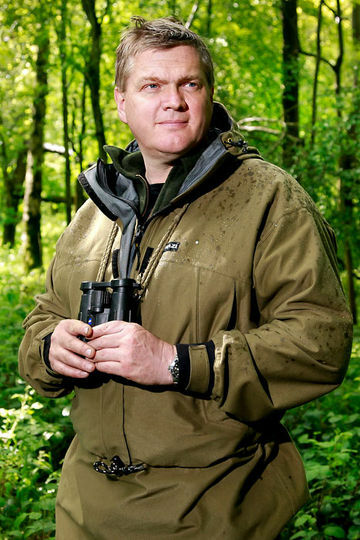 Quietly spoken, Ray is recognised worldwide as a true master of the outdoors. Having spent the majority of his life learning to be at home in places others describe as hostile, he has unparalleled experience and in-depth knowledge. It is this that enables Ray to design, develop and lead exciting expeditions for Woodlore. Ray continues to work tirelessly to share his understanding so that others may "drink from the well of bushcraft". Ray's biography is also available to read. 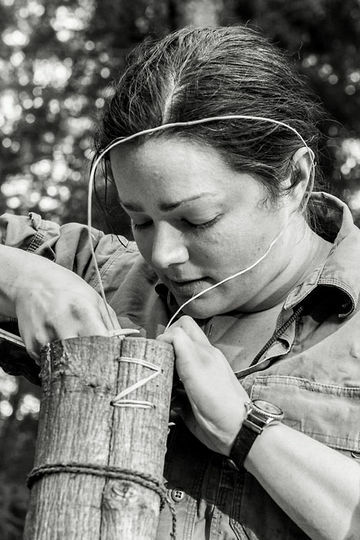 Joining the Woodlore team in 2006, Sarah arrived at her interest in Bushcraft after a childhood spent camping with family, cooking dough twists and kippers over open fires and scouring the beaches for fossils. At the age of eight she was bought Ray Mears Survival Handbook. In the years since, she has tried many of the different Bushcraft skills including cordage using a variety of natural fibres, basketry, dyeing using vegetable dyes, pottery, flint knapping, bone working, bow making (and archery) and, of course, shelter and fire. Many of Sarah's skills (fibre work, basketry and pottery in particular) were also acquired as a result of her continued involvement in reenactments of Tudor life at a local manor house in which she has been taking part since the age of seven. Sarah's love of creative work led her to starting a degree in fashion and textiles in September 2007. Sarah also enjoys sailing, hiking, hill walking, and has been involved with the Scouts as an assistant leader. Sarah is working her way through solo and tandem canoeing certificates, a relatively new interest sparked by two months working at a canoe camp in Canada in the summer of 2005. In 2010, Sarah passed the Woodlore Aspirant Instructor test and received her Aspirant Instructor certificate. Brian joined the Royal Marines in 1980 and during this time he served in many countries ranging from desert to arctic, jungle to mountains. Brian completed several survival courses within those terrains. After leaving the forces, Brian obtained a Law Degree, and is also a qualified teacher in the Longlife Learning Sector which has enabled him to teach law and procedure within the West Midlands Police. Brian's love of the countryside has continued where he spent many a foray hill walking, scrambling and camping. Brian's interest in Bushcraft was inspired by Ray's many television programmes and books on the subject. Brian pursued this interest by attending many courses with bushcraft becoming his number one pastime. Brian joined the Woodlore Team in 2008. Brian has recently been promoted to Sergeant at a very busy police station in Birmingham. In 2010, Brian passed the Woodlore Aspirant Instructor test and received his Aspirant Instructor certificate. A profound affinity with nature has always been a major part of who Nick is. Through childhood, fascinated by animals and plants, he enjoyed learning about the natural environment whilst maintaining a sense of the wonder, awe and appreciation of its beauty. Having sought to be outdoors his work has included arboriculture, woodland management, landscaping and gardening. Married to "the most beautiful woman ever created", he is the proud father of four fantastic (now adult!) children. Modern Western culture seems to exorcise natural rhythms and richness from our lives. Bushcraft is one path into a more harmonious interaction with God’s creation. Working with the Woodlore team learning and sharing, is very rewarding; both learning and sharing with others, who have an empathy for people and nature that I recognise within myself. 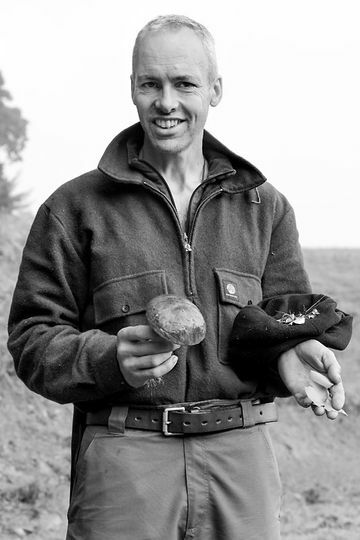 Tom was born and brought up in Wiltshire where he developed a love of the outdoors. On family orienteering and camping trips, Tom spent many a happy hour exploring and making shelters in the forests and landscapes he visited. With strong Welsh roots, summer holidays were spent on the North coast of Pembrokeshire where he developed his range of water skills – fishing, surfing, kayaking and coasteering. Always a strong swimmer, Tom is a former Junior Welsh surf swim Champion and professional beach lifeguard. He has worked as an assistant instructor at an outdoor activities centre in Pembrokeshire, leading surfing and coasteering groups and developing his climbing, walking and kayaking skills, also improving his knowledge of the local environment. 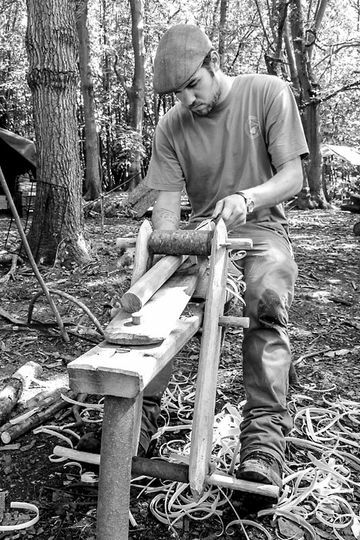 Tom was introduced to Woodlore through a Fundamental Bushcraft course that he was given as an 18th birthday present and after completing his Campcraft course the following year, he was invited to attend a recruitment weekend. I once took a day off school (with parent's permission) to attend a book signing by Ray at a local bookshop in Marlborough, where my mother asked Ray if he did apprenticeships. Although Ray laughed and declined the offer, I am delighted to be where I am today and I'm looking forward to developing my experience further! In 2011, Tom passed the Woodlore Aspirant Instructor test and received his Aspirant Instructor certificate. I have found it so very satisfying and rewarding to see how Woodlore's customers can begin a course with uncertainty and trepidation but finish with confidence and a hunger to learn more but most of all a big smile. Adrian's interest in the great outdoors began at a very early age living on the edge of the Pennines in North Derbyshire. He was extremely lucky to be surrounded by friends and family who enjoyed many aspects of the outdoors. He went fishing and camping with friends all over the country, from Scotland to Cornwall. He had friends that taught him to sail and canoe on a reservoir and the Rivers Trent and Dove near his home. Another friend taught Adrian and his brothers to ski in a field on a local farm which led to a life long interest in all snow sports including Nordic Skiing and Snowboarding. He has snowboarded all over Europe and North America. After a period of living in the big cities of Milan and London, Adrian had the urge to get back to the nature he had previously enjoyed. 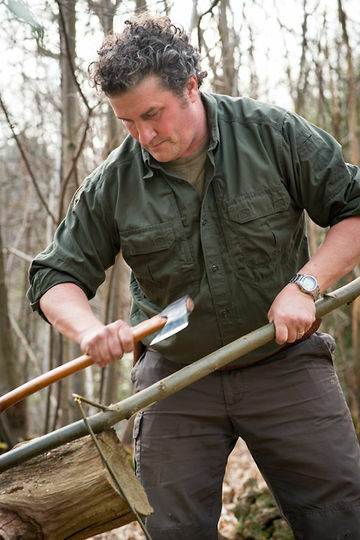 This led Adrian to Woodlore's Fundamental Bushcraft course in 2004. The rest, as they say, is history! 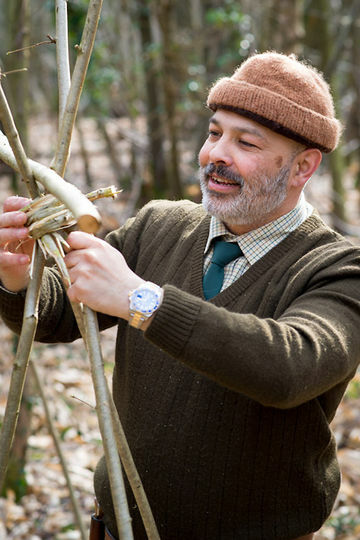 Adrian has worked as a carpenter for twenty years now and through his love of this job, he has developed a keen interest in many of the craft aspects of Bushcraft, including greenwoodworking, carving, birchbark craft and knifemaking. 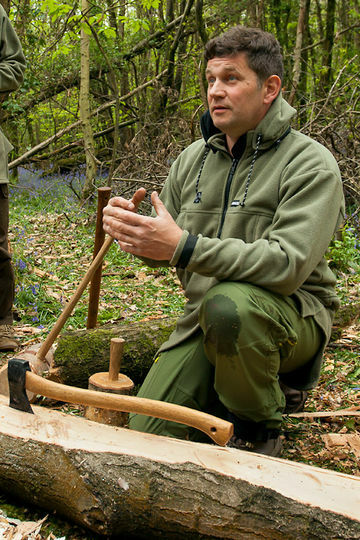 Adrian joined the Woodlore team in 2008. Callum has spent the majority of his time in the countryside of West Sussex and the surrounding areas since he was very young. Woodland bushcraft is his first and ongoing love but he has an appreciation for all aspects of this broad and infinitely fascinating subject. Recently, Callum has started his Summer Mountain Leadership qualification, his latest undertaking in his progression within the outdoor education industry. Callum's first introduction to Woodlore was when he attended the Junior Fundamental Bushcraft course at the age of thirteen. Caught by the bushcraft bug, he then applied and completed two work experience placements before joining the Woodlore team in January 2010. Away from Woodlore, Callum currently works as a landscape gardener and is also the designer of the Elementree Kindler. To work at Woodlore, with the knowledge, enthusiasm and practical skill of the team is always exciting and presents vast opportunities to progress. I enjoy the rigor and reward of outdoor living, but I also thoroughly enjoy being a part of each student realising the magic of bushcraft. There is something wholly satisfying in watching individuals overcoming challenges and learning new skills. Wayne was born and bred on the Isle of Wight, where he still resides with his wife and two young children. Growing up he enjoyed many outdoor activities based around the sea, including windsurfing, fishing and coastal camping. Wayne joined the scouting movement at a young age and later became a keen outdoor sportsman including shooting and ferreting, generally anything associated with the outdoors! Wayne has enjoyed travelling to many countries over the years, and has come to realise how this develops you as a person, giving you both experience and confidence in dealing with life's situations. Closer to home he enjoys spending time in the varied habitats the Island has to offer, from salt marshes and shingle beaches to pine forests and open downland. 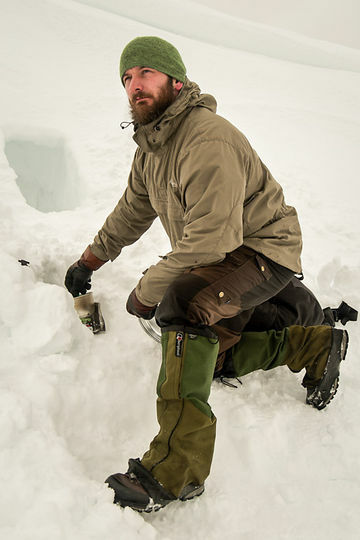 A keen follower of Ray's work, Wayne embarked on the Arctic Survival Course with Lars in February 2009. This he thoroughly enjoyed and learnt a great deal about the very extreme environment. Following this, he attended the Woodlore Selection Process and began work as an assistant in 2010. Since working for Woodlore I have been impressed by the high standards and level of professionalism demonstrated by the entire team, and have been able to add to my skills through training and guidance. As a child growing up in Wiltshire, Steve spent much of his spare time in the outdoors cooking over a campfire, camping out with friends and has always enjoyed being in the woods. When he was older Steve didn't lose this passion, instead it progressed into hill walking, deer stalking and starting a career in conservation. Being in natural places, feeling that he is a part of that ecosystem and knowing that he has the self discipline to not only survive there but to live and be a part of it is key to Steve. As a practical conservationist Steve understands how humans are part of nature rather than believing we are outside of it. Spending time in a natural environment reminds you that you are not separate from the woods, you are a part of it. I love the feeling of just taking a few belongings to make life possible and relying on your skills and wit to live comfortably. Steve feels bushcraft is a fun and practical medium to allow us to see and use the vast diversity of renewable resources that our natural world offers and therefore gives us a deeper respect for nature. In 2016, Steve passed the Woodlore Aspirant Instructor test and received his Aspirant Instructor certificate. Born and raised on Salisbury plain, David spent a lot of his youth exploring the wide open spaces, secluded valleys and copses. During his childhood he spent family holidays in the Lake District, on the south coast, Dartmoor and in the West Country. David was a member of the Army cadets which meant a lot of his time was spent outdoors on exercises and adventurous training. His first navigational lesson was from his father on Dartmoor at the back of Oakhampton camp aged 8, which fired his great interest in map work. Serving for 5 years in the Army, working in and undertaking survival courses in the jungle of Guyana, arid lands of the Middle East, Norway and temperate environments here in the UK showed David what a person is capable of beyond their own expectations. 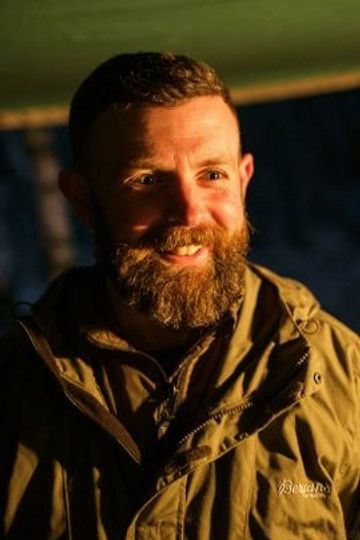 Enrolling on the Woodlore Fundamental Bushcraft course in 2007, while living in Plymouth, changed how David viewed his trips out to Dartmoor; he began wanting to enjoy the journey as well as the destination. David spent a lot of time building on the skills learnt at Woodlore by reading, watching and listening to any source of knowledge on Bushcraft, then getting out trying things, be that in the garden or the highlands of Scotland. David joined the Woodlore Team in 2011 as an assistant. In 2017, David passed the Woodlore Aspirant Instructor test and received his Aspirant Instructor certificate. I love the countryside of Britain, though I enjoy travelling to other countries, Britain still holds me in awe of the places people seem to dismiss as found, conquered and tamed. This just isn't true; you only have to spend a night outside in any piece of our green land to know how wild it still is. Dee grew up in a rural mining village in Shropshire where she spent time building dens, catching frogs and saving slow worms from her cats. She has been working in environmental conservation for National Trust since 2009 after many years working in community arts management. 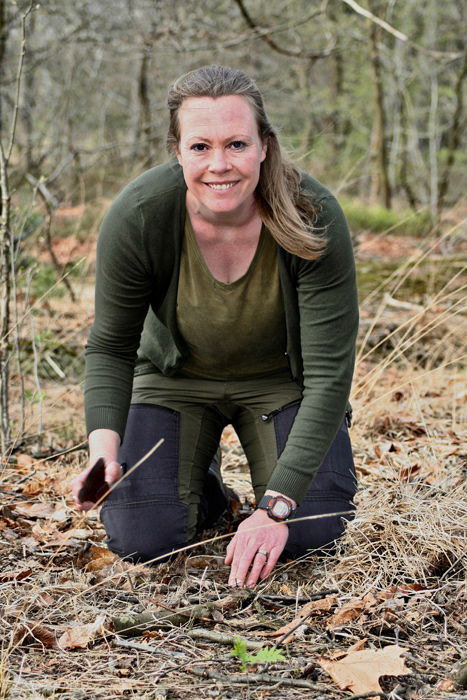 Her work in conservation focuses on engaging young people from urban areas with nature through training, volunteering and outdoor activities that help improve the environment for both people and wildlife. The job allows her to combine her passion for outdoor education and ensuring nature is accessible to everyone; with her passion for the natural environment and the opportunities it offers. She spends her free time camping, wild swimming, gardening and walking and finds them the perfect antidote to the complications of modern life. 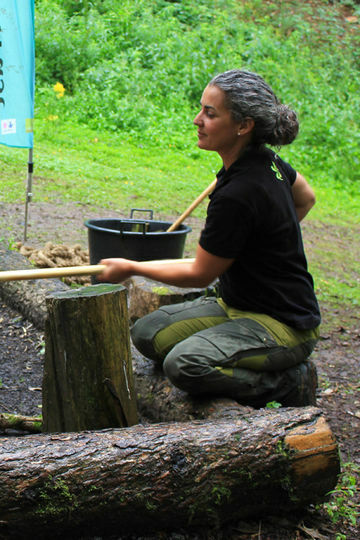 She first attended a course with Woodlore in 2016 to improve the skills that would help engage young people in Birmingham through wild camping, bushcraft and traditional crafts. The quality of the course and the skill level and enthusiasm of the instructors inspired her to go on the Fundamental Bushcraft course in 2017. Dee joined the team in 2018 and she is looking forward to supporting these courses while taking the opportunity to learn from the Woodlore team. The courses have given me the confidence and desire to challenge myself both at work and on my own adventures in the outdoors and I hope that as I continue to learn and develop my own skills and knowledge I can inspire others to do the same. I believe developing your connection with nature and understanding your part in it can have a profound impact on your approach and quality of life. The more people that can be given the chance to learn the skills and confidence to enjoy being in nature, the more likely we are to take care of it. James grew up in semi-rural East Sussex and spent much of his childhood playing in the nearby woods, building dens and enjoying the freedom afforded to his generation. Throughout his teens and into adulthood he maintained a love of the countryside but eventually felt a strong urge to form a deeper understanding of the natural world. Inspired by Ray's work, he embarked on a series of courses throughout 2017, starting with Fundamental Bushcraft and ending with the incredible adventure of The Journeyman. In 2018 he attended a Woodlore recruitment session and was invited to join the company as an assistant. My experience with Woodlore as a client was a game-changer so being welcomed into the team is both exciting and humbling. I look forward to helping others along their own journey whilst also improving my own skills. Stella grew up on the coast of Holland, where a love of the outdoors was born combing the beach. Frequent trips to the Belgian Ardennes as a child sparked a lifelong love for navigation and roaming the woods. Still residing in Holland, Stella now lives in a wooded area and goes out often to learn about the natural world. Stella has a keen interest in traditional living skills and is always trying to master new techniques including cordage making with a variety of natural fibres, basketry, the identification of edible and medicinal plants, fire lighting and building shelters. A follower of Ray’s works she attended several Woodlore courses, wanting to learn and better understand her natural surroundings. Following this, she attended a Woodlore recruitment session and was invited to join the company as an assistant in 2018. She hopes to share her enthusiasm for the natural world around us with students whilst continuing her own learning. For me bushcraft is the basis for the life we lead in this modern world. Many skills and knowledge are fading rapidly and I feel it is one of my jobs to let people connect with that knowledge again. Being invited to join the Woodlore team was both a dream come true and a very humbling experience. The level of skill and also the willingness to share knowledge among the instructors is wonderful. To be able to work and learn with so many skilled and knowledgeable people is a true gift.